eBay merchant builds growing business on 'designer' teddy bear fashions. It's said that the most fulfilling careers are often those that start from doing what you love to do. That's certainly been true for Jane Russell, whose eBay Store, Build Your Bear's Wardrobe, evolved from a passion for accessorizing her daughter's doll collection. "I literally fell into it," she says of her foray into selling teddy bear-sized clothing, boots and shoes, which began in 2004. "I started out by modifying teddy bear clothes to fit Annabell and Zapf Creation dolls, because at the time, they were always babies, not toddlers like my daughter was," she explains. "When I would sell them on eBay, people asked me if they would fit cabbage patch dolls. So that sort of took off." Russell later learned that the doll clothing was similar in shape and size to the garments made for wildly popular teddy bear brands like Build-A-Bear and The Bear Factory, and decided to focus around that niche. But sources within the U.K., where she's based, were few and far between. "I noticed the U.K. sellers on eBay were buying from the same place, and selling the items within a couple of pence difference in price," she recalls. "I felt like I needed to look different to make a way forward." The need to stand out from the competition led to a business decision that would ultimately define Russell's business: She decided to create her own teddy bear clothing styles. With about 15 designs to start with, she ventured to sourcing site Tradekey.com. There, she linked up with two different manufacturers in China—each of which has strengths that complement the other—and began importing her custom designs. She now markets her product line as "Designer Wear 4 Your Bear." "It was quite scary and overwhelming," she says of searching for sources online. "You enter some information about what you're looking for and you, of course, get millions of replies. Then you have to troll through quite a lot of rubbish to find something that might work. "And there's quite a lot of trust to go forward then, because you start parting with money. You're committing yourself to thousands of dollars, and you think, 'Gosh, I haven't gotten anything yet,'" she adds. "But I feel it's a very good decision to have made—particularly now with the recession—because I'm in control of my price points. "It allows me to compete with the big retail shops, because I can deliver right to your door in the U.K. for the same cost of well-known brands you'd get in the shops," she explains. "So why bother going out and getting something when you can actually have it delivered to you for the same price? And it's different and better, as far as I'm concerned." Over the past three years, Russell has grown her catalog to more than 100 designs. In that time, her eBay revenue has increased by 500 percent. Using Auctiva's eBay listing tools has afforded her the flexibility to create and store listings and profiles, and schedule listings to post when it's convenient. It's also enabled her to carefully monitor inventory as her product line grew. "As I've gone from having 15 lines to 100, it keeps nice track in one place of all my products," she explains. "I can see a photograph of any given product line, what it's called, what I paid for it, what I sell it for. I find it really easy to look at where I am with it." As Russell's business has grown, so has her confidence—and with it, her desire to spread her wings and develop beyond eBay. In June, she made the leap to her own Web store. Though not yet fully functional, the site is completely self-designed, using knowledge gleaned from designing her eBay Store. She's also just opened an Auctiva Commerce Store to take advantage of its no-store-fees promotion and have another sales channel available to Christmas and post-holiday shoppers. However, having an off-eBay site has brought "a whole new set of challenges," she says, the biggest being how to get the word out about the store. "eBay has such clout. Everybody knows eBay," she notes. With an independent Web site "it's a matter of how do you get noticed, and doing the right kind of marketing." In addition to promoting her new site through her free Auctiva Store and eBay About Me page, she buys pay-per-click advertising on eBay and Google. And to further differentiate herself, she's begun selling wholesale lots to online merchants within the U.K. Though the down economy is straining buyers and sellers alike, Russell says her eBay sales have remained "surprisingly" strong, considering her products are more of an indulgence than a necessity. August and September receipts were down about 30 percent compared to the same months in 2008. And visitor traffic was sharply off—by more than 40,000 in the month of September alone. Yet she's seen a positive trend emerge: "Those people that are buying are spending more; instead of just buying one item, they're buying an average of 2.5 things," she reports. "My average price points have gone up over 30 percent." In response, Russell has put together holiday promotions that feature gift ideas and value-priced sets, rather than individual items, to appeal to budget-minded gift buyers. And, like last year, she expects many shoppers will wait until the last minute—or even until January—to make their holiday purchases. "In some respects, that doesn't affect me much, because we have very few of the specialty bear stores in the U.K. But it does affect me as far as the whole pot of money the customer has to spend," she notes. "From here on out, it's just knowing the marketplace—and thankfully, I've not made any costly mistakes," she laughs. Visit Build Your Bear's Wardrobe. What a great story! I am impressed with your courage to invest in your dream of owning a busines, and congrats on your success. 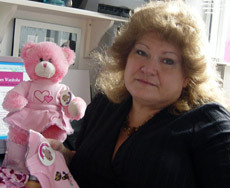 Your products are adorable, coming from a mom of 2 daughters and several bears and various other dress-able stuffies!